Working all day I want a meal that is quick to throw before I leave in the morning and then when I get home there is not much left to do. Well this is it! This makes it's own sauce with tender chicken and mushrooms to just leave the pasta to boil. Here's an answer to what taste gourmet and like you have cooked this from scratch, a tender chicken with the richest gravy flavor! Place the chicken in the crockpot. In a small bowl mix the gravy, seasonings and herbs, add the wine. Pour over the chicken. Cook on low for 8 hours. Cook the pasta to your preference, drain. Toss with 3 tablespoons olive oil and 1/4 cup grating cheese like parmesan. Serve the chicken mixture over the pasta, spoon the sauce over the top. Sprinkle with more cheese and dried parsley and serve. Note: for a much thicker sauce add 3 tablespoons of wondra flour with water to make a paste, add the to crock pot for 10 minutes to thicken sauce. I had some slowcooker chicken with soya beans for the lunch today. Love yours with mushrooms too. I'm so totally in slow cooker mode right now. This sounds amazing, Claudia. Crockpot cooking is a blessing. 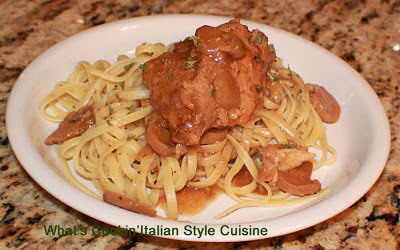 Chicken Marsala is my BW's favourite chicken dish. The last 6 chicken dishes I made were marsala, that 1.5 litre bottle is going fast. Haven't made it in a slow cooker but is certainly worth a try.